You can watch the Quick Start Guide, which shows you the basics. How to I Buy Blocks? Press "B" while in-game. Click the item category you are interested in, and finally left click an item to buy it. Hold shift to buy 5, or control to buy a full stack (usually 80). 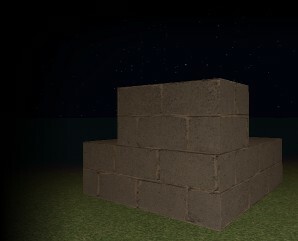 How do I Remove Blocks? Press "N" to bring up the iNventory screen. Here you can rearrange items, or sell unwanted items for credits. How do I Prevent my Buildings Being Vandalised? On most servers, you can purchase land and this will make it so that only you can place or remove blocks there. To do this, press "M" to bring up the Map Screen. Then click on a lot, then "Buy Lot". Keep in mind that other players could use rockets to blow things up! How to I Spawn Buildings? Use the /lot export command and the /lot import command to export and import buildings. You can even export buildings from one map and load them in another, and rotate them. To join lots together, use the /lot merge command. See the Console Command Guide for more information. Keep in mind you must be an Op or higher. I've Used "Host Server" to Start a Server. Why can't others see it on the "Find Server" screen? For a server to be publicly listed, it must have the "Public Game" setting turned on. This is below the "Start" button in the Host Server screen. I'm Playing Demo Mode. Why can't I log into servers? Many servers ban the demo player to prevent abuse. How can I Get More Performance? Voxel Turf will run on a toaster, however older machines will struggle with larger maps. For windows, XP or greater is required. At least 512 MB of RAM is required (768 MB recommended). Voxel Turf is lightly multithreaded (both the client and server), so 2 cores are recommended. It should me noted that the vast majority of the code is single threaded.